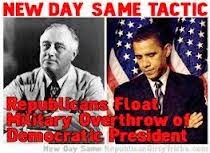 For those who think that today's GOP is different than your grandparents', Joshua Holland's article at Salon.com, courtesy of Billmoyers.com, "The Plot To Overthrow FDR: How The New Deal Sent Conservatives Into A Rage, tells us how in a short history lesson how "The right's temper tantrums over Obamacare are nothing compared to what Roosevelt had to deal with." "Every baby step toward guaranteeing American working people a minimum of economic security with new social insurance programs has been greeted with howls of horror and outrage — and predictions that the end of the Republic is near. 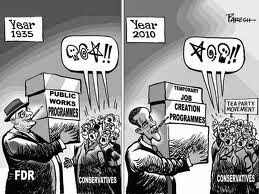 Every new addition to the safety net has been met with a concerted campaign by conservatives and the business establishment to undermine it. Eighty years after it was signed into law, the Social Security Act, arguably Franklin Delano Roosevelt’s signature piece of legislation, still is under attack from the right. "Last week, historian Harvey J. Kaye told Bill Moyers how FDR created a progressive generation that helped change American society in dramatic ways. Investigative journalist Sally Denton details a darker reality of that period in her 2011 book, FDR, a Nation in Crisis, and the Rise of the American Right. It was a time, she writes, in which radicals of various stripes questioned the viability of American democracy and a group of bankers went so far as to plot to overthrow the president. "On Saturday, the 79th anniversary of Roosevelt’s death, BillMoyers.com spoke with Denton about this poorly remembered history. Below is a lightly edited transcript of our discussion. "Joshua Holland: Today, we think of FDR as a heroic figure. He remains one of the most popular presidents in the public’s imagination. How did business interests react to his presidency at the time – and to the significant changes he was bringing about with the New Deal? "Sally Denton: My book focuses on the year 1933, his first year in office, and there was great alarm throughout the country. It was the height of the Great Depression, and there was a sense that he was moving the country in a dangerous direction, especially among the moneyed interests. They saw him as a traitor to his class. There was concern that he had taken the dollar off the gold standard and there were elements on Wall Street and in major American corporations that were very worried about where he was heading. "There are parallels to today, when we see the same kind of hue and cry, and fear that America is turning socialist. 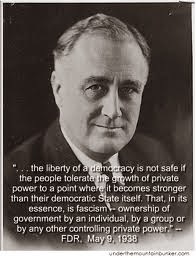 But remember that Franklin Roosevelt was an über capitalist, so in retrospect, it all seems a little bit disingenuous, if not silly. "It’s the kind of rhetoric that one might hear today about the Affordable Care Act — another rather modest social insurance program that’s supposedly depriving us of liberty. "Denton: That’s true. 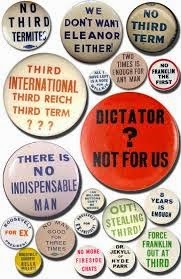 I write a great deal about the various organizations that got their start around that time in response to the New Deal, many of which later morphed into modern conservative institutions. "But I also explore the populism of Huey Long, who was approaching FDR from the left, and who thought he was not doing enough to redistribute the wealth. And then there was the right-wing populism of Father Coughlin. They led two very popular populist movements of the time, both of which were focused on this deep dissatisfaction with the role that government was playing — the role that Franklin Roosevelt wanted government to play — and they were equally vitriolic and angry from opposite sides. I found that fascinating. "I called that section of the book, 'a rainbow of colored shirts.' There were silver shirts and black shirts and brown shirts. Some were Christian fundamentalists, some were extremely anti-Semitic, some were very anti-interventionist/isolationist. There was an anti-European impulse that ran very deep. There was a great collection of these kind of nascent organizations that were really just coming together to respond to what seemed to the right wing a very dangerous new administration. "Holland: In the period before World War II, fascism and communism were — not mainstream, but they were considered to be legitimate ideologies to a far greater degree than after the war. "Denton: That’s right. And Huey Long on the left and Father Coughlin on the right kind of symbolized that. Father Coughlin was rabidly anti-communist, and so even though they had some of the same complaints about the concentration of power in government, Coughlin thought that Huey Long had communist tendencies, which he saw as the most dangerous thing in the world. And Huey Long thought that Coughlin had fascist tendencies, which was really the extreme form of corporate capitalism with unfettered regulation. "There was a great intellectual pursuit on all sides about what the best form of government intervention was at this point. In 1933, there were thousands and thousands of unemployed and impoverished and hungry people roaming the streets of America. There was a great fear that there actually could be a revolution — that there could be violence. "In fact, there had been violence the year before, when the Bonus Army was dispersed by federal troops. So all of this was very real. It wasn’t like today’s armchair conversations about various forms of government. Everything was in play. Hitler was in play, Mussolini was in play. It was all happening. "Holland: What was the Bankers Putsch? "Denton: The Bankers Putsch was an ill-fated plot, sometimes called the Business Plot or the Wall Street Putsch. There was a famous, heroic marine general named Smedley Butler, who was kind of the soldier’s soldier, the veteran’s veteran. He had great influence with the veterans, and this was at a moment when there were a half million veterans who were trying to get their bonuses from World War I. The bonuses weren’t supposed to be released until 1945, but because so many of the veterans were starving, there was a great movement afoot in 1932 to get those bonuses released early. 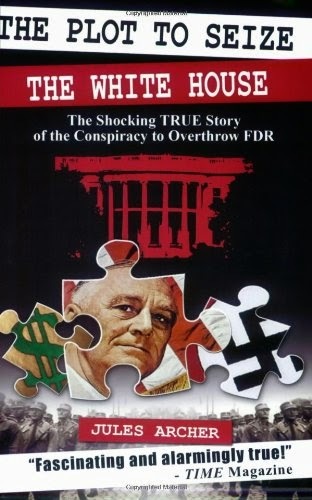 "And Smedley Butler claimed that he was approached by a couple of veterans who had connections to Wall Street financiers who were planning a nonviolent coup, a takeover of the Roosevelt Administration. They claimed to have $3 million that they were willing to spend toward this end, and they said that they had some armaments ready. And their theory was that Roosevelt was in over his head — again, we see a lot of the same rhetoric that we hear with Obama. And they thought FDR would welcome somebody coming in and taking charge because he didn’t know what to do. That was the theory, that they would go in and, because these men who were supplying the money were of Roosevelt’s class, Roosevelt would agree to their demands and become kind of a ceremonial figurehead. He would let these stronger, more military types control the White House. "Butler blew the whistle on it, so it never got very far at all. There were congressional investigations and there was an FBI investigation, and the media reported various aspects of it. But both the plot and the investigation were stopped before they got very far. So it’s unclear how much of it was a form of insanity on the part of the plotters and how much they really had any legitimate financial and military support. But it’s a fascinating story of that year. 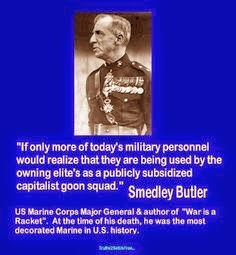 "Holland: Smedley Butler wrote a book called, War is a Racket, which is a damning criticism of what would later be called the 'military industrial complex.' It’s strange that they would’ve seen him as a potential ally. 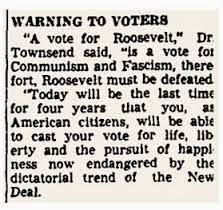 He was also a Roosevelt supporter, no? "Denton: Well, he was a Republican and had run for Congress as a Republican. 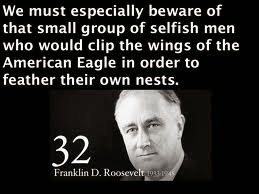 But he was not a huge FDR fan. Although I think he became one down the road. "But, yes, he’s the one who said that the marines were just racketeers for the capitalists. And he probably aligned himself more with Roosevelt after Roosevelt made clear that he thought that the US military should not be acting as enforcers for United Fruit throughout the world. "I think the impetus for selecting him was that there was no other military figure whom this half million-strong potential army of veterans would follow, and there must’ve been an assumption that Butler was malleable enough to stand up for the veterans above all else. And it backfired. He became the whistleblower and told the government what was going on. "Holland: There was also an assassination attempt against FDR in 1933. "Denton: Yes. 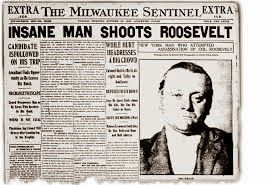 Five people were wounded and the mayor of Chicago was killed in an attempted assassination of FDR. An Italian immigrant named Guiseppe Zangara was responsible. Roosevelt was coming into Miami, and he had not yet taken office. In fact, that was one of the reasons that the inauguration was changed from March to January, because there was this long interregnum between when Roosevelt was elected in November of 1932 and when he took office in March of 1933. And at the time, the country’s falling apart and nobody’s in charge — Herbert Hoover’s thrown his hands up and is appalled that he’s lost the election, and the country’s really teetering. "Roosevelt was cruising around the Caribbean with some of the people that had become part of his brain trust and his advisers, and they came into Miami. There was a motorcade taking them downtown, and when they got to this ballpark where FDR started to speak, this Italian laborer opened fire. Anton Cermak, who was the mayor of Chicago, had just reached out his hand to shake hands with Roosevelt and he got hit. And Roosevelt insisted that the Secret Service put Cermak in the back of the car with him and they sped off, and he lived for a short time and then died of infection. There were four other spectators who were also hit in the fire. "Zangara was quickly subdued and taken to the jail in Miami and interrogated, and he said he wanted to kill all capitalists. That was his motivation. So he was coming from the opposite side of the bankers. He was found guilty and executed in Florida’s electric chair. "Holland: It’s interesting how these stories have become somewhat lost in our popular history. "Denton: The coup attempt was dismissed and marginalized — and even ridiculed. Zangara was railing against capitalists, and saw Roosevelt as — he just assumed that he was also a raging capitalist fascist, and he was a very anti-Mussolini, anti-fascist labor activist. 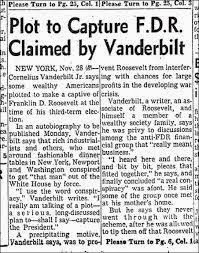 "And both of these events, the Wall Street Putsch and the assassination attempt, have been so marginalized in the Roosevelt history that I became fascinated by how deep this impulse against Franklin Delano Roosevelt ran, and how far people were willing to go to see him destroyed." As we pointed out in the beginning of this site, Conservatism is a historical criminal organization, as we can readily see by the statement, "we see a lot of the same rhetoric (80 years ago) that we hear with Obama." And "...how far people were willing to go to see him destroyed?" Today's Conservatives are no less criminal than Conservatives 80-plus years ago. They're the same old gangsters in politicians skin, the same criminals in three piece suits, trying to usher in a new Age of American Feudalism. 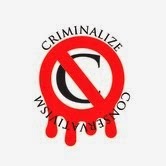 The ends justify the means with gangsters, and the Conservative gangsters will always have the protection of the law -- until Conservatism is criminalized. Rep. Jim Bridenstine (OK-R), on the legal status of Obamacare.